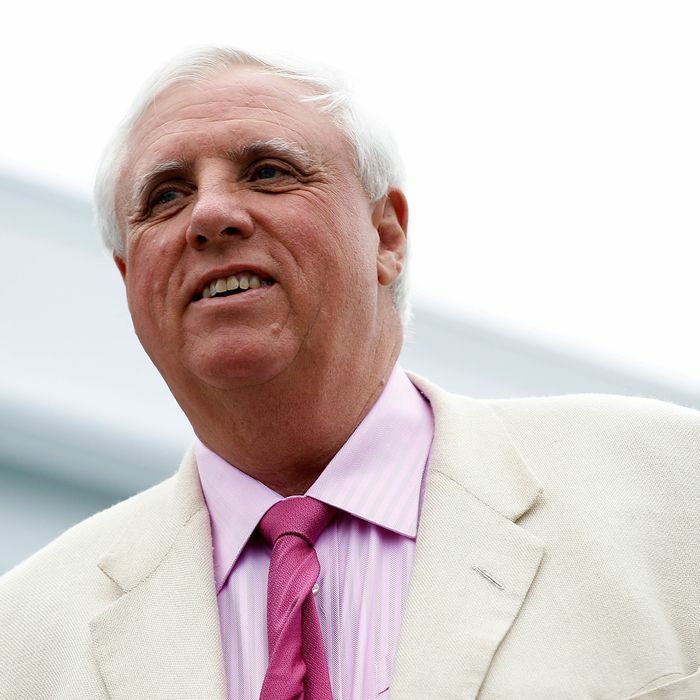 At a press conference on Tuesday afternoon, West Virginia’s Republican governor, Jim Justice, signaled that he would veto the controversial omnibus education proposal that has West Virginia teachers preparing to walk out again. The bill, introduced by the governor’s own party nearly a year after teachers launched a historic walkout over low pay and the state’s chronic underfunding of its public insurance agency, gives public employees another pay raise. But it also provides for the creation of charter schools and education savings accounts, which would allow parents to divert public funds to subsidize the costs of homeschooling or private school tuition. Justice's take on the omnibus education bill: "A dog's mess for the sake of creating a dog's mess to hit back." Justice urged legislators to instead pass his original proposal to grant public employees a 5 percent pay raise on its own. Senate president Mitch Carmichael, a Republican who has championed the bill, shrugged off the threat of a veto in remarks to reporters. “We just have to deal with that. In this state we have options for mistakenly vetoed bills. We’ll just approach it as we go through the process,” he said, as reported by Brad McElhinny of West Virginia MetroNews. Reached by New York ahead of Justice’s press conference, teachers repeatedly condemned the omnibus bill as “retaliation” for last year’s walkout, which ended after unions and legislators reached a deal to raise public employee salaries by 5 percent and promised more funding for the state’s Public Employee Insurance Agency. “This year the mood is different. We’re disgusted,” Katie Endicott, who teaches in Mingo County, said on Tuesday morning. Mingo County’s teachers were some of the first in the state to walk out, and on Tuesday evening, they signaled that they were prepared to do so again. Ninety-seven percent of school employees in Mingo County voted to authorize “one day of action” should they deem it necessary, the Mingo County Educational Association and the American Federation of Teachers-Mingo announced. (A successful authorization vote does not necessarily mean that a walkout will happen. Union officials must then set a date for a walkout, unless school employees decide to stop work without authorization from leadership, which is called a wildcat strike.) Union leaders in other counties, including Logan and Kanawha, scheduled emergency informational meetings for Tuesday and Wednesday. Endicott, along with fellow Mingo County teacher Robin Ellis, singled out the bill’s charter-school provisions for specific condemnation. “What they’re asking us to accept is that they’re buying us off,” Ellis said. “It’s a trade-off for public education.” Both Ellis and Endicott said they were prepared to vote in favor of authorizing a walkout. The fact that Mingo County helped pioneer 2018’s walkouts weighed on both teachers. In Mingo, Ellis said, teachers lit a spark. “We thought the spark would turn into a flame across the state, then it spread across the nation,” she said. “Everyone’s eyes are on us,” Endicott said. Justice’s pledge to veto the bill has not quelled walkout talk. Jarrod Farrar, who teaches high school English and is an assistant football coach at South Charleston High School in Kanawha County, told New York that he’s prepared to vote in favor of authorizing a walkout. “I think it’s a horrible bill, horrible for West Virginia and horrible for our students,” he said, adding, “There are schools that don’t have heat. There are schools that don’t have adequate materials. Charter schools would strain us financially.” Kanawha County’s Sissonville High School currently suffers from electrical issues and is closed until this Friday. Though Farrar praised Justice for his opposition to the bill, he worried about the possibility that the legislature would override a veto. “I think that myself and many other teachers are ready to do whatever it takes to make sure we’re heard,” he said. The bill has advanced out of the Senate Education Committee. In an unusual move, Republicans bypassed the Senate Finance Committee and convened a Committee of the Whole, which as the Gazette-Mail reported essentially turns the entire Senate into a committee. The Committee of the Whole will meet on Wednesday morning.